Before it became the name of one of the world's most beautiful buildings, Taj Mahal was the name of a woman. She was Arjumand Banu Begum (begum is a title for a Muslim woman of high social rank), the favorite wife of Shah Jahan, who was the Muslim ruler of India's Mughal Empire from 1628 to 1658. 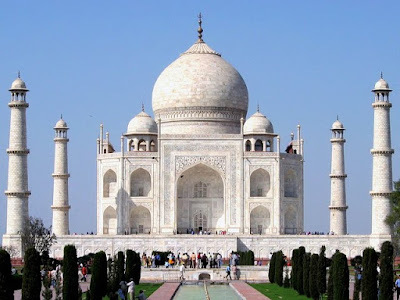 He affectionately called her Mumtaz Mahal, meaning “ornament of the palace.” The name Taj Mahal came from this term of endearment and was given to the mausoleum he built for her. 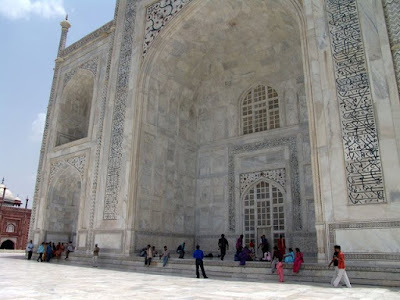 The Taj Mahal is a mausoleum, a burial place. Jahan and his wife were married in 1612, and she was his inseparable companion until her death in childbirth in 1631. His grief led him to design and construct as magnificent a building as possible for her final resting place. 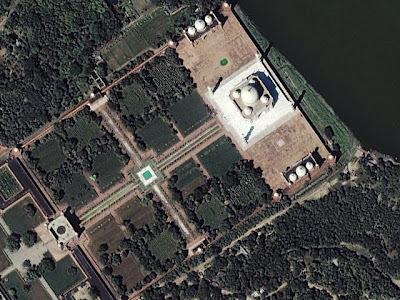 Later Jahan also was buried there. The mausoleum is set within a large complex of gardens and other buildings, enclosed within a high red sandstone wall with octagonal turrets at the corners. 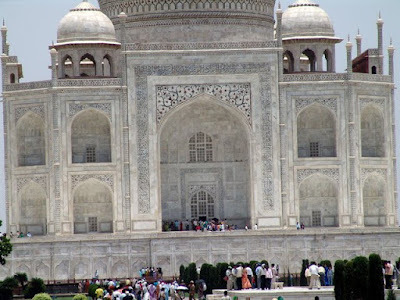 The Taj Majal stands on a square marble base 312 feet (95 meters) per side and 23 feet (7 meters) high. The building is a square of 186 feet (57 meters) per side with grooved corners and a massive arch in each face, rising to a height of 108 feet (33 meters). Atop the entire building is a large, onion-shaped dome. It is supported on a tall drum, and the top stands 243 feet (74 meters) above garden level. There are parapets over each arch. 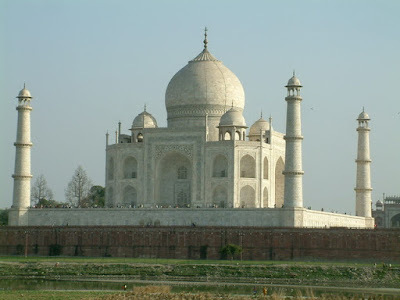 It was on the south bank of the Yamuna River, outside the city of Agra, that Jahan decided to erect his memorial. The whole complex is a rectangle measuring 1,900 feet (580 meters) by 1,000 feet (305 meters), aligned north and south. In the center of the rectangle is a garden area 1,000 feet on a side, leaving an oblong area at each end. At the south is the sandstone gateway and other buildings. At the north end is the mausoleum, flanked on each side by identical buildings. One is a mosque, and the other is called its jawab, or duplicate. These are made of red sandstone with marble necked domes and some surface decoration. 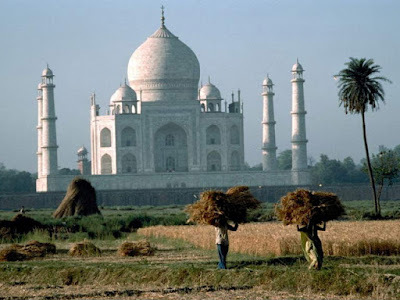 The construction of the Taj Mahal took 22 years, from 1632 to 1654. More than 20,000 workers labored daily to complete the mausoleum itself by 1643. A council of architects was called in from India, Persia, and other places. Credit for the final plan is usually given to Ustad Isa, who was either Turkish or Persian. But there is some uncertainty about who really drew the plans. It may have been a Turkish architect, Isa Muhammad Effendi, a pupil of the greatest Turkish architect of his time, Sinan. Or it could have been a Venetian named Geronimo Veroneo. Much of the decoration, apart from geometrical designs, consists of verses from the Koran written in fine calligraphy in marble. It is believed that Amanat Khan Shirazi from Persia was in charge of the calligraphy.